State mottoes may be said to reflect the character and beliefs of the citizens of the state, or more accurately, the citizens of the state when they were adopted. State mottoes can help us gain insight into the history of a state. Audemus Jura Nostra Defendere is Alabama's second motto. Alabama's first motto, Here We Rest, was approved by a Republican legislature after the Civil War, during the period referred to as "Reconstruction." It was approved with the adoption of a new state seal, replacing the one that had been used for 50 years. The replaced state seal, a carry-over of the Alabama Territorial Seal, depicted Alabama and its major rivers. The new seal displayed a bald eagle perched on the shield of the United States Seal. 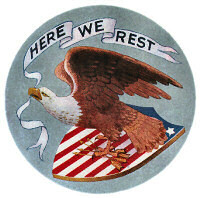 In the eagle's beak was a banner that read "Here We Rest". Over 70 years later, in 1939, the original seal was restored as the Great Seal of Alabama. At the same time, the state legislature adopted an Alabama Coat-of-Arms along with a new state motto: Audemus Jura Nostra Defendere, translated as "We Dare Maintain Our Rights." Act No. 140, to adopt an official Coat-of-Arms for the State of Alabama was approved on March 14, 1939. Here We Rest was never accepted as an appropriate motto for their state by many Alabamans. It was looked upon as an imposition of "outsiders" during Reconstruction. It seemed like a negative statement about the state coming after the Civil War. Audemus Jura Nostra Defendere provides a positive, strong response in support of state's rights. An interesting bit of trivia about this motto is that it originated in English and was translated into Latin. The motto was translated into Latin by Professor W. B. Saffold, of the University of Alabama. The following information is excerpted from the Code of Alabama 1975, Title 1, Chapter 2, Sections 1-2-1 and 1-2-2. The Alabama Coat of Arms is described in heraldic terms as well as lay terms. Official coat of arms - General description. Alabama shall have an official coat of arms which shall be as follows: a shield upon which is carried the flags of four of the five nations which have at various times held sovereignty over a part or the whole of what is now the State of Alabama: Spain, France, Great Britain and the Confederacy. The union binding these flags shall be the shield of the United States. The shield upon which the flags and shield of the United States are placed shall be supported on either side by an eagle. The crest of the coat of arms shall be a ship representing the "Badine" which brought the French colonists who established the first permanent white settlements in the state. Beneath the shield there shall be a scroll containing the sentence in Latin: "Audemus jura nostra defendere," the English interpretation of which is "We Dare Maintain Our Rights." The word "Alabama" shall appear beneath the state motto. Official coat of arms - Description in heraldic terms. The coat of arms of Alabama as described in heraldic terms shall be as follows: arms: quarterly, the first azure three fleur de lis or (for France); second quarterly first and fourth gules a tower tripple towered or, second and third argent a lion rampant gules (for Spain); third azure a saltire argent and gules over all a cross of the last fimbriated of the second (for Great Britain); fourth gules of a saltire azure, fimbriated argent 13 mullets of the last (for the Confederacy); at center in escutcheon chief azure paly argent and gules 13 (for United States) arms supported by two American eagles displayed. Crest: A full rigged ship proper. An Ode in Imitation of Alcaeus: Sir William Jones's (1746-1794) poem of 1781, An Ode in Imitation of Alcaeus.